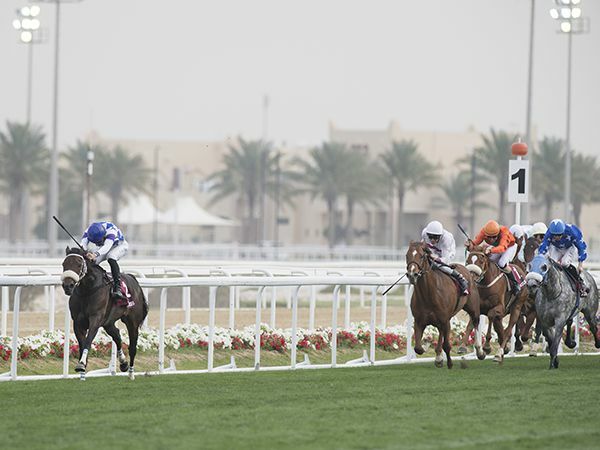 9,000 guineas Tattersalls Autumn Horses in Training purchase CHOPIN completed an extraordinary run of Tattersalls success at the prestigious three day Emir’s Sword Festival in Qatar, when winning the $1 million local Group 1 Emir’s Trophy. In total 10 of the 11 thoroughbred contests run over the three days at the Al Rayyan Racecourse were won by horses purchased by their connections at either the Tattersalls Autumn Horses in Training, July, or February Sales. CHOPIN’s impressive victory earned his Bahraini owner Maher Lutfalla almost £500,000 in prize money, having purchased the German-bred son of SABIANGO through Ahmed Alanzoor for only 9,000 guineas at the 2015 Tattersalls Autumn Horses in Training Sale. The seven year old, now trained in Bahrain by Abdullah Kuwaiti, was a Group 3 winner in Germany prior to finishing seventh behind RULER OF THE WORLD in the 2013 Investec Derby. The almost total Tattersalls dominance of the thoroughbred contests at Al Rayyan began with Jassim Ghazali’s 30,000 guineas 2016 Autumn Horses in Training purchase THORNDYKE, followed swiftly by another shrewd Ghazali purchase HILLSIDE DREAM, bought for 42,000 guineas at last year’s July Sale. Prior to CHOPIN’s spectacular win in the $1 million Emir’s Trophy, Tattersalls purchases had landed the two local Group 2 contests, with the evergreen eight year old SOVEREIGN DEBT winning the Group 2 ITM Cup and three year old MR SCARAMANGA winning the Group 2 Al Biddah Mile. SOVEREIGN DEBT, trained by Dandy Nicholls for Lady O’Reilly, took his lifetime earnings to £560,000 having been purchased by Nicholls for 145,000 guineas at the 2014 Tattersalls February Sale. MR SCARAMANGA's win in the Group 2 Al Biddah Mile was a well-deserved triumph for Epsom trainer Simon Dow and owners Robert Moss and Christopher Brennan who purchased the son of SIR PERCY for 90,000 guineas at last year’s Autumn Horses in Training Sale. CHOPIN - Winner of the Group 1 Emir’s Trophy, purchased 2015 Tattersalls Autumn Horses in Training Sale from Jamie Railton (Agent) by Ahmed Alanzoor for 9,000 guineas. MR SCARAMANGA - Winner of the Group 2 Al Biddah Mile, purchased 2016 Tattersalls Autumn Horses in Training Sale from East Everleigh Stables by Robert Moss for 90,000 guineas. SOVEREIGN DEBT - Winner of the Group 2 ITM Cup, purchased 2014 Tattersalls February Sale from Fitzroy House Stables by Dandy Nicholls for 145,000 guineas. ALTARSHEED - Winner of the H.H. The Emir’s Shalfa, purchased 2016 Tattersalls July Sale from Shadwell Stud by Jassim Ghazali for 110,000 guineas. SECOND LIFE - Winner of the Thoroughbred Handicap, purchased 2016 Tattersalls July Sale from Godolphin by Richard Venn Bloodstock for 38,000 guineas. THORNDYKE - Winner of the Thoroughbred Maiden, purchased 2016 Tattersalls Autumn Horses in Training Sale from Hambleton Lodge Stables by Jassim Ghazali for 30,000 guineas. HILLSIDE DREAM - Winner of the Thoroughbred Handicap, purchased 2016 Tattersalls July Sale from Jamesfield Stables by Jassim Ghazali for 42,000 guineas. ADHAM - Winner of the Thoroughbred Handicap, purchased 2016 Tattersalls July Sale from Jamesfield Stables by Abdulatif Hussain Al-Emadi for 27,000 guineas. BRONZE MAQUETTE - Winner of the Thoroughbred Fillies and Mares, purchased 2014 Tattersalls Autumn Horses in Training Sale from G.L.Moore Racing by Abdulatif Saad Al-Muslamani for 120,000 guineas. TOPSY TURVY - Winner of the Thoroughbred Handicap Trophy, purchased 2014 Tattersalls Autumn Horses in Training Sale from Shalfleet Stables by Abdulaziz Al Boenain for 15,000 guineas.